The United States Congress designated the Noatak Wilderness (map) in 1980 and it now has a total of 5,765,427 acres. All of this wilderness is located in Alaska and is managed by the National Park Service. The Noatak Wilderness is bordered by the Gates of the Arctic Wilderness to the east. Together with neighboring Gates of the Arctic Wilderness, Noatak Wilderness protects almost the entirety of the largest untouched river basin in America, that of the Noatak River. 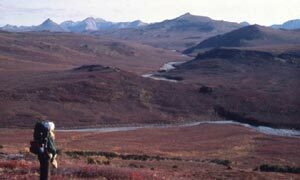 The Noatak Wilderness comprises all, except for about 700,000 acres around the village of Noatak, of the Noatak National Preserve. From glacial melt on Mount Igikpak in the Brooks Range (in Gates of the Arctic National Park), the mostly gentle Noatak River flows westward 425 miles through the heart of the preserve to Kotzebue Sound, patiently carving the scenic Grand Canyon of the Noatak along its course. From its source to its confluence with the Kelly River, 330 miles have been designated Wild and Scenic, making it the longest river in the Wild and Scenic System. More and more visitors each year come to canoe and kayak on the Noatak, and almost the entire river may be paddled easily. Those who fish can try to catch Arctic char, grayling, whitefish, or salmon. Here in the land of the summer midnight sun, above the Arctic Circle, the huge Western Arctic caribou herd roams, 200,000-plus strong. Backpacking in the foothills, among the bears, wolves, lynx, and Dall sheep, has been increasing in popularity, and backcountry travelers must move with care, as this land is fragile. Bird life abounds in the migratory seasons. Alpine tundra occurs at high elevation, and moist tundra, the most common condition, supports cottongrass, willows, Labrador tea, mountain alder, dwarf birch and other tundra species at lower elevations. Boggy areas support cranberry, bog rosemary and salmonberry. Camping is unrestricted, but you should avoid the numerous private lands on the lower Noatak River. Firewood is scarce. Campsites are best on river sandbars and high, dry tundra knobs. Plan on encountering swarms of ravenous mosquitoes during summer. Motorboats, small airplanes, and snowmobiles are permitted. Hunting and fishing are allowed. Planning to Visit the Noatak Wilderness? How to follow the seven standard Leave No Trace principles differs in different parts of the country (desert vs. Rocky Mountains). Click on any of the principles listed below to learn more about how they apply in the Noatak Wilderness.